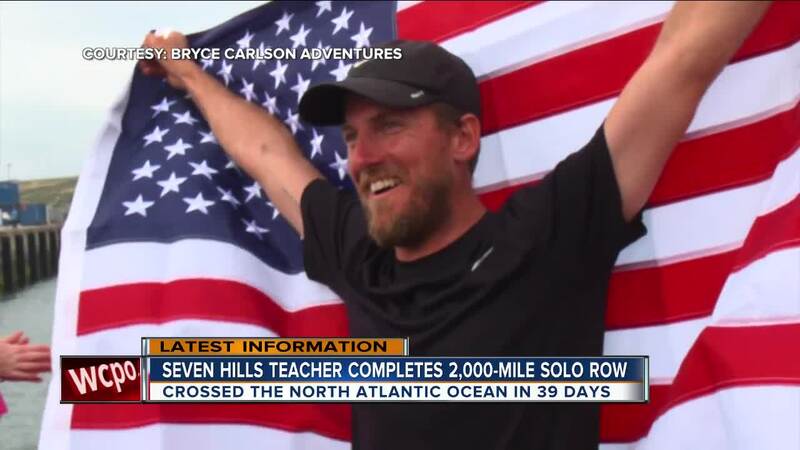 CINCINNATI -- Seven Hills biology teacher Bryce Carlson completed his remarkable journey Saturday, rowing solo across the North Atlantic in what appears to be record-shattering time, according to his Facebook page. WATCH Carlson's family greet him in the video player above. Carlson unofficially beat the record by two weeks in becoming the first American to row solo and unsupported from west to east across the North Atlantic. Carlson finished the 2,000-mile trip in just over 38 days. The previous record for a west to east solo crossing is 53 days, 8 hours, 26 minutes. Carlson officially arrived in St. Mary’s Harbour on the Isles of Scilly on Saturday at 7:39 p.m. British Time (2:39 p.m. EDT). Scilly is off the southwest tip of England. He took off from St. John's, Newfoundland, on June 27. Carlson's team believes he also set a record for fastest North Atlantic crossing of any unsupported row boat, no matter the number of rowers. That record is held by a boat of four. Carlson withstood the remnants of a hurricane, capsizing and consistent fog and completed the journey in 2-3 weeks sooner than he predicted. SEE videos, photos, updates on Carlson's Facebook page. Carlson had intended to row ashore at the mainland harbor of Penzance, but with winds and currents stalling his progress, he changed course, his spokesperson said. Scilly is a standard end-point for ocean rowers and counts toward any records. Carlson said he invested $75,000 of his own money in a customized boat. It features an extra solar panel, a small covered space where he could sleep and room for extra food and supplies. Bryce Carlson crossed the North Atlantic in this customized rowboat. "This kind of adventure is usually reserved for the professional athletes sponsored by the biggest brands," he said on his website before embarking. "I've maxed out my credit to build a boat and show the world I'm serious, that this is happening. I've invested $75,000 of my own to build the fastest and safest solo rowing boat in the world, but will need probably another $75,000 to reach the finish." He named the boat Lucille after his grandmother. Carlson said she was a strong woman who always supported him. Bryce Carlson rowed from St. John’s, Newfoundland, to Isles of Scilly in England. Carlson, who is rowing coach at Seven Hills, said he expected the trip to take 50 to 60 days, depending on whether he got bad or favorable winds, so he finished much sooner than he thought. To train, he said he spent a lot of time rowing at East Fork Lake in Clermont County. Carlson used his Facebook page and website to allow followers to post questions about his adventure. He had a message for his students: He hoped they’re were getting as much out of summer vacation as he was.